With the help of Stephanie Morrison from RGU, GFAA have been in discussions with HMP Grampian about possible areas of mutual interest and benefit. 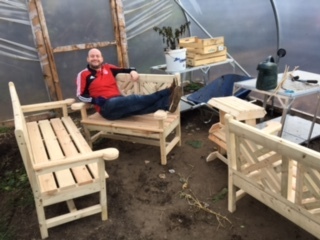 These discussions have now borne first fruit with the creation of a fine set of benches and footstools built for us from reclaimed timber in the Peterhead workshops. There are two three-seater and one two-seater bench in the set, matching footrests and a splendid Japanese-style Pergola to match. Together they will make splendid additions to our site – both decorative and functional. Thanks also go to Andy from RGU who was good enough to offer his van and time with Stuart to pick up the set from Peterhead and deliver them on site. Andy – testing for size! The items are now housed in the polytunnel awaiting painting. If any plotter is able to spare some time to help with this please see Stuart in the first instance. 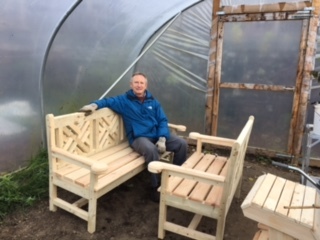 Thanks go again to Stephanie, Andy, and all those at RGU and HMP Grampian for their help in getting this project underway. We look forward to further developments in the New Year.